PIKEVILLE – Pikeville Medical Center (PMC) has received full Atrial Fibrillation Certification status from the Society of Cardiovascular Patient Care. Atrial fibrillation is the most common cardiac arrhythmia and has become recognized as a health concern that in some cases can lead to stroke and possible death. Nearly 3 million patients in the United States have atrial fibrillation and the numbers are rapidly increasing as the population ages. Atrial fibrillation patients use more healthcare services and have much higher healthcare costs than those without the disease. 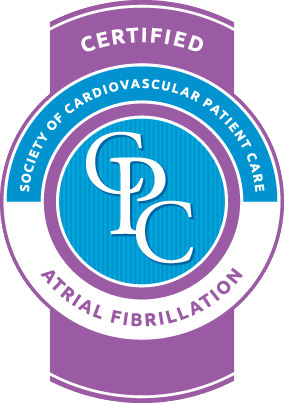 The Society of Cardiovascular Patient Care’s (SCPC) goal is to help facilities evaluate and manage atrial fibrillation patients more effectively and improve patient outcomes. PMC has demonstrated its commitment to quality patient care by meeting or exceeding a wide set of stringent criteria and undergoing a comprehensive review by an accreditation review specialist from the SCPC. For more information about PMC’s Heart & Vascular Institute, call 606-218-3500. To schedule a physician appointment, call 606-218-2201. After a detailed review and on-site survey, Pikeville Medical Center was awarded a Level IV Accreditation as a Chest Pain Center with PCI by the Society of Chest Pain Centers. This highly-acclaimed distinction made PMC one of the first five in the nation, and the first hospital in Kentucky to earn this accreditation. PCI (percutaneous coronary intervention) refers to a variety of procedures used to treat patients with diseased arteries of the heart caused by a build-up of fats, cholesterol, and other substances from the blood (referred to as plaque) that can reduce blood flow and lead to chest pain or a heart attack. Pikeville Medical Center’s Heart Institute features the region’s most experienced cardiology professionals. The group, comprised of interventional cardiologists, cardiothoracic surgeons, vascular surgeon, cardiologists and an electrophysiologist, the Heart Institute uses the state-of-the-art diagnostic tools to provide world-class quality care. Pikeville Medical Center’s accreditation means the hospital can provide the whole continuum of care, from diagnostics to heart surgery procedures, on site. PMC’s Chest Pain Center strives to quickly diagnose cardiac patients, begin treatment within minutes and significantly improve the chance of a positive outcome. Studies show that Chest Pain Centers reduce mortality rates by 37 percent. More than five million Americans visit hospitals each year with chest pain, but only ten to fifteen percent of the patients are diagnosed with an acute myocardial infarction, or heart attack. We achieve success with early intervention and rapid initiation of therapy. Pikeville Medical Center worked with local emergency service providers to equip ambulances with EKG monitors capable of relaying test results during transport. This allows members of PMC’s Chest Pain Center to implement a plan of action while the patient is en route to our emergency department. According to the American Heart Association (AHA), Coronary Heart Disease is the No. 1 killer in the United States. Statistics show that about 7.9 million people (age 20 and older) have survived a heart attack. This year, the AHA predicts that 1.2 million Americans will suffer their first heart attack. Warning signs often include tightness or pressure in the chest and may also spread to the shoulders, neck and arms.